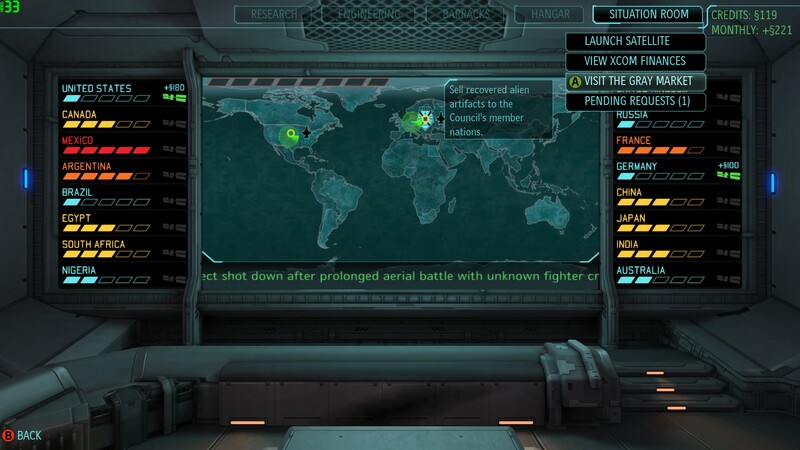 Welcome back to my Let’s Play (Classic difficulty, Ironman mode) of XCOM: Enemy Unknown! 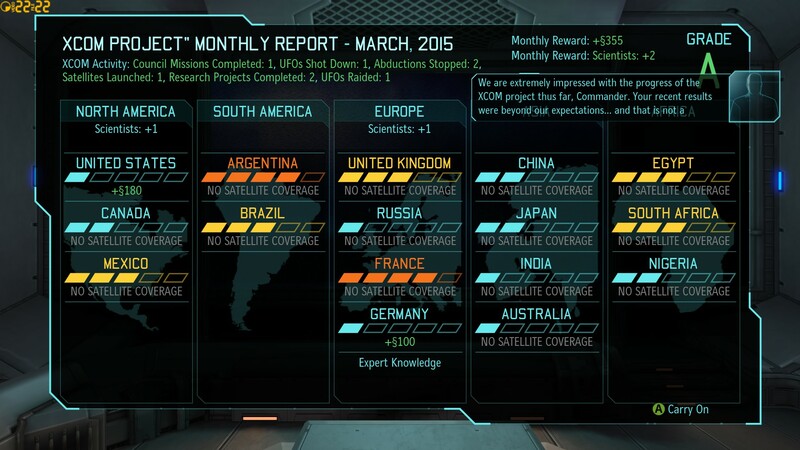 We finished our last instalment on March 20 (game time), with a successful end to XCOM’s third battle. Following that battle, XCOM earned a new, experienced Heavy named Talorc, and I began construction of the Officer Training School. 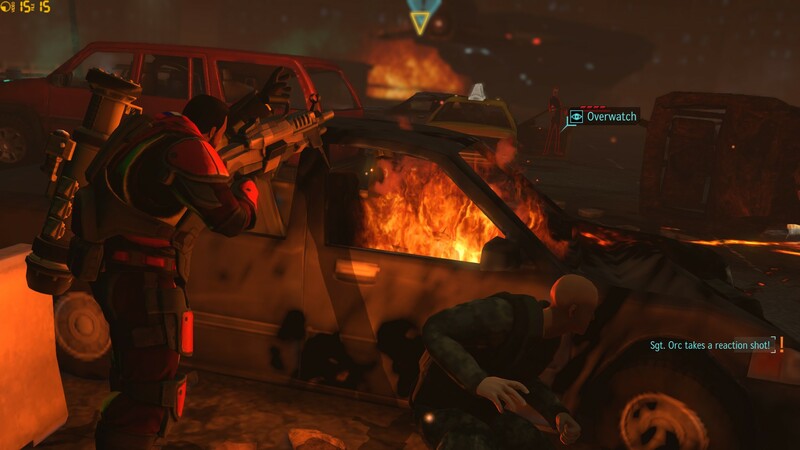 The reward for this mission will be ANOTHER levelled Heavy, plus cash. What’s not to like? I pull him back to safety, and then I lay a little groundwork. Remember I said I watched a lot of preview videos of the game? 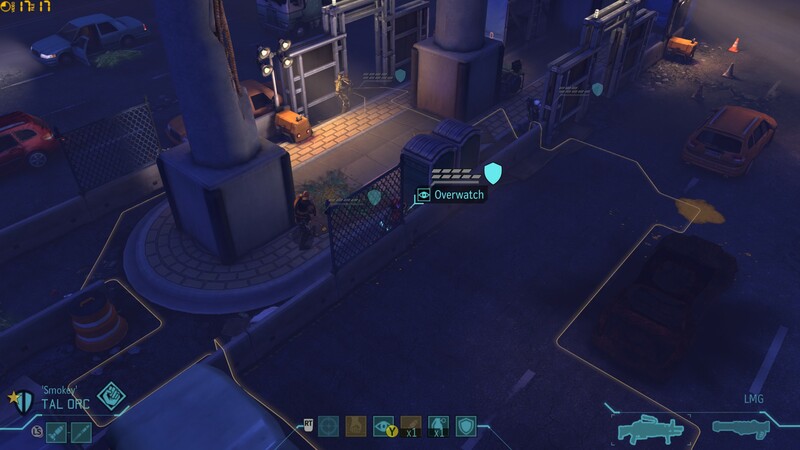 One of them happened to show this exact mission, so forewarned, I line up my squad behind cover, facing the way I’d come. 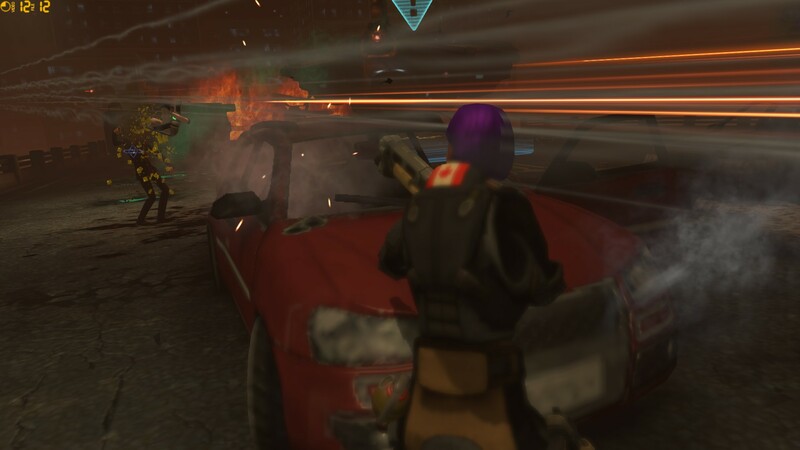 And sure enough, Thin Man reinforcements drop in along the route to the exit – and right into my squad’s crosshairs. 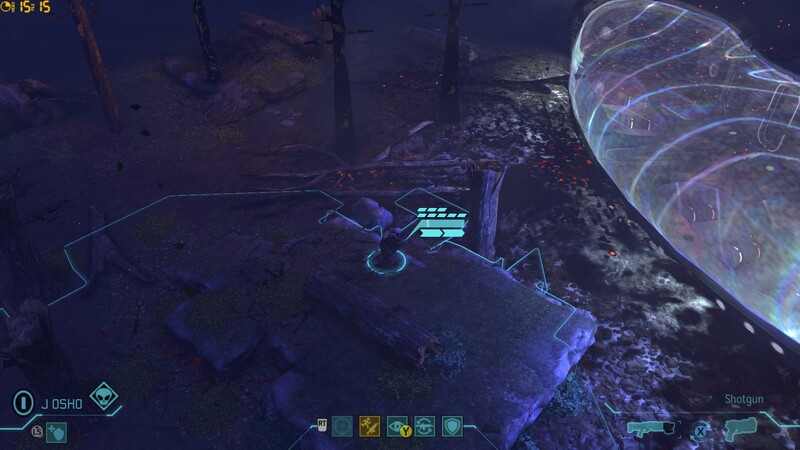 With Van Doorn safely extracted, it’s back to the other end of the map (where we first found him) to mop up the last Sectoids. 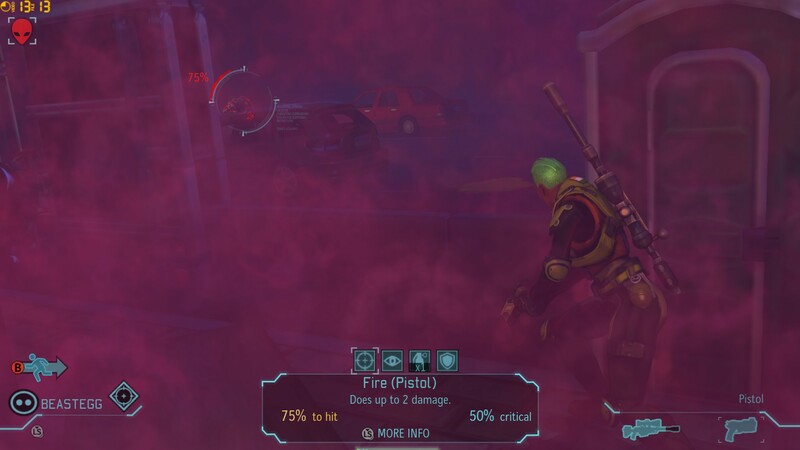 They have the high ground, which makes things decidedly hairy, but with the help of Thasero’s and Farnsworth’s smoke grenades, I finish the mission without losing anyone. The new Heavy, Brian Rubin, joins our ranks. Whereas I levelled up Talorc to be a debuffer, I focus Brian on raw killing power: I give him the “Bullet Swarm” (allowing him to fire twice per turn) and “Shredder Rocket” (fire a second rocket, which does less damage but weakens the target’s defences) abilities. More good news: the satellite I ordered at the start of the month completes! I launch it over the United States, which will give me a much-needed funding step-up (§180 per month; to put this in perspective, at my current construction cost, this is enough to build two and a half new satellites!). Hurray! 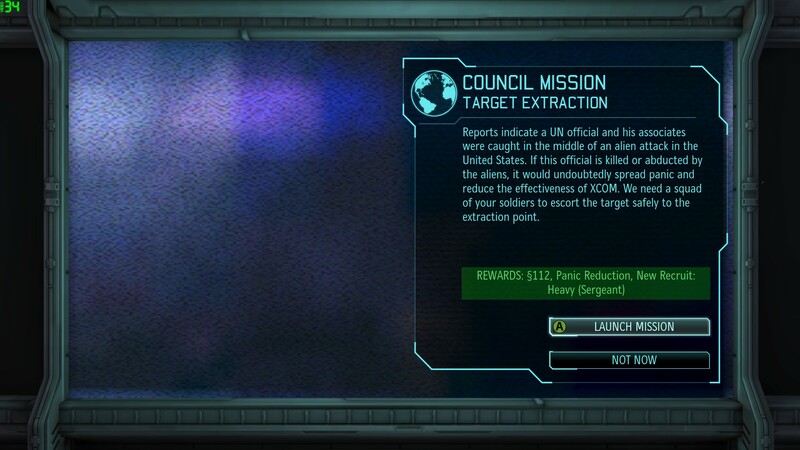 XCOM has gotten off to a flying start, according to the Council, and we now have our monthly funding cheque. I promptly turn around and spend the money building another satellite (#3) and the new satellite uplink that it requires. 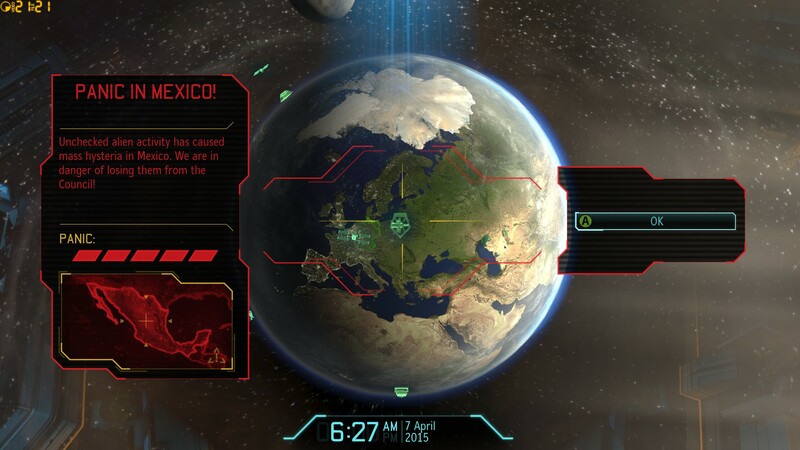 A few days later, Canada picks up the phone to XCOM with an interesting proposition. If I launch a satellite over their skies in the next 20 days, they will grant me a reward of §200, in addition to the regular monthly funding boost. I like the sound of that. Conventional wisdom is that scientists (who speed up research) are the least useful mission reward, but in this case (a) I’m rushing to research better weapons/armour and (b) I would prefer not to lose South America, so Brazil it is. This battle takes place on a highway bisected by a median strip. Cover comprises cars and, on the median strip, support pillars, concrete barriers, and of all things, Port-a-loos. Remembering my disastrous first battle, which also took place on a road, I fret – but the mission gets off to a good start. My squad advances perpendicularly across the map (i.e. rather than going HURR down one side of the road, my soldiers fan out to cover the width of the map). 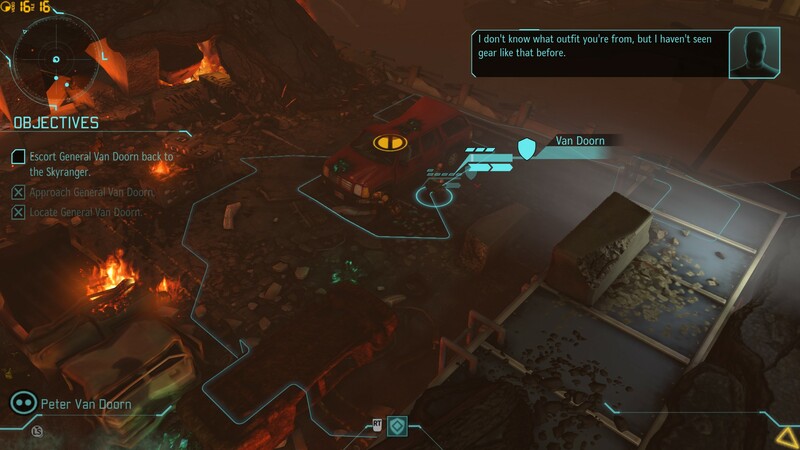 Along the way, aliens die without incident, and Brian proves his mettle when he blasts two Thin Men (and the car they were using for shelter) with a rocket. 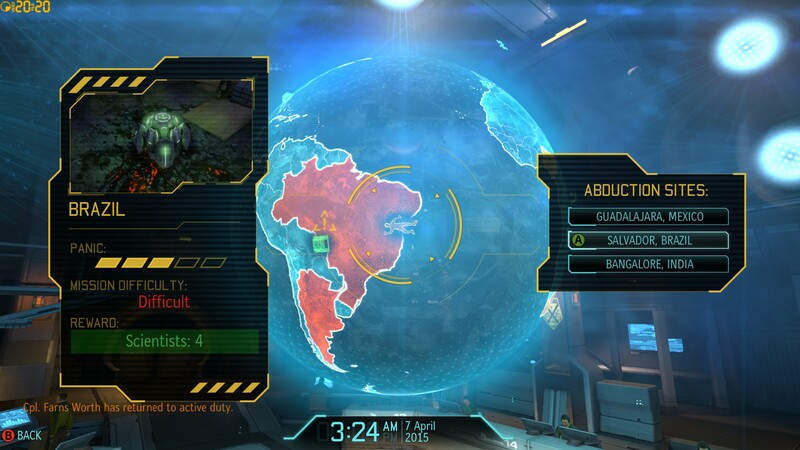 On one side of the road (the top-left, in the above screenshot), my soldiers can hear aliens moving just out of sight. Most of the squad advances along the median strip in an attempt to flank the aliens, while frogbeastegg and the wounded Thasero hang back. Soon, the squad comes into contact with its quarry – it’s a new species, the jetpack-equipped Floater. And all hell breaks loose. Another group of Floaters emerges from the other side of the road (top-right), turning that median strip into the filling in an alien sandwich. I hastily pull a little back, and use Thasero’s smoke grenade and Talorc’s suppression fire to boost everyone’s survivability. 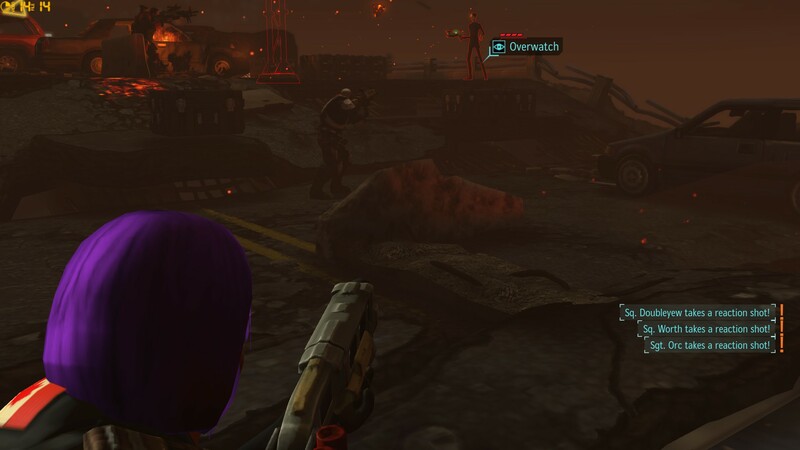 Somehow, in a haze of purple smoke and close-quarters machine gun fire, everything works out: most of the Floaters straggle into my sights, Josho sprints back to blast one Floater who’d jetpacked behind the squad, and frogbeastegg finishes off the last Floater with her pistol. Arrrgh. I really don’t want to lose a country this early, and that means I should send satellite #3 to Mexico when it’s ready. But I also really want the cash from Canada. I won’t have to make the decision for some time yet, but having to likely wave goodbye to what had looked like a sure-fire payoff is a discouraging thought. 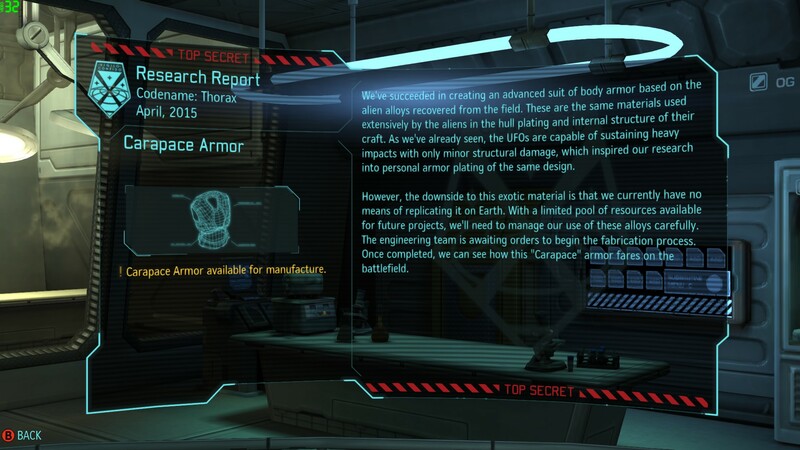 On the bright side, Dr Vahlen makes good use of her new scientists, completing Carapace Armour research on 9 April! I build a single suit straight away… and lack the funds to build any more. (This is why I wanted that money from Canada!) Oh, well. 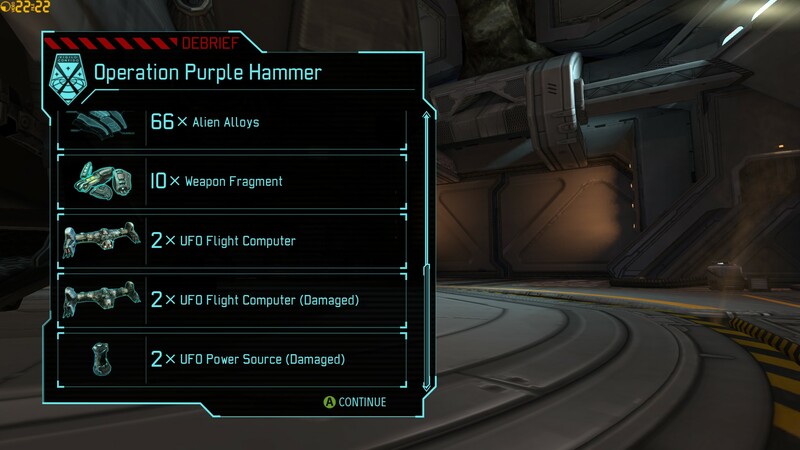 I order Dr Vahlen to start research on beam weapons. A few days later, my satellite over the US detects another UFO – this one medium-sized, unlike the small UFO I shot down last month. In spite of that, my interceptor brings down the UFO in a surprisingly easy air battle. It’s time to send in the infantry. For this mission, I want my best. I send in Farnsworth, Talorc, Josho, frogbeastegg and Brian Rubin – all experienced operators. Note that Farnsworth is wearing the Carapace Armour; Talorc and Brian have more health (and hence more survivability) by virtue of their higher rank, Josho (in lieu of carrying a grenade) is wearing a Nano-Fibre Vest under his starting body armour, and frogbeastegg, as a sniper, should be safely hanging back anyway. The squad combs its way through a forest, mowing down aliens as it goes. At last, the UFO comes into sight, and up close it is eerily beautiful – a mix of sleek lines, glowing blue force fields, and orange sparks that drift up in the night sky. It is also intimidatingly big, dwarfing the five soldiers of my squad. How many aliens, how many ambushes, could lurk within? Best to draw them out. So I line up my squad in good firing positions just outside the UFO’s entrances, and wait. I must have waited for a good 20 minutes, yet the aliens did not oblige. Nothing blundered outside into my crossfire. So with my heart in my hands, I order my men into the UFO. 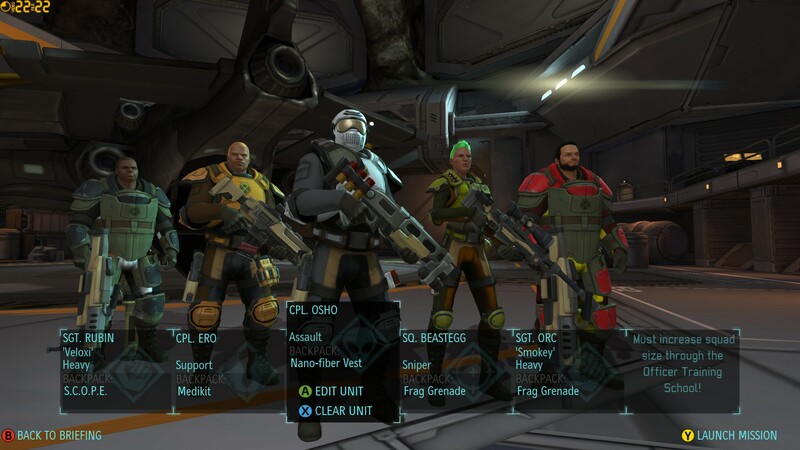 My soldiers creep past consoles, blow apart a suspicious wall, double- and triple-cover every corridor. Except in one, last, little room. 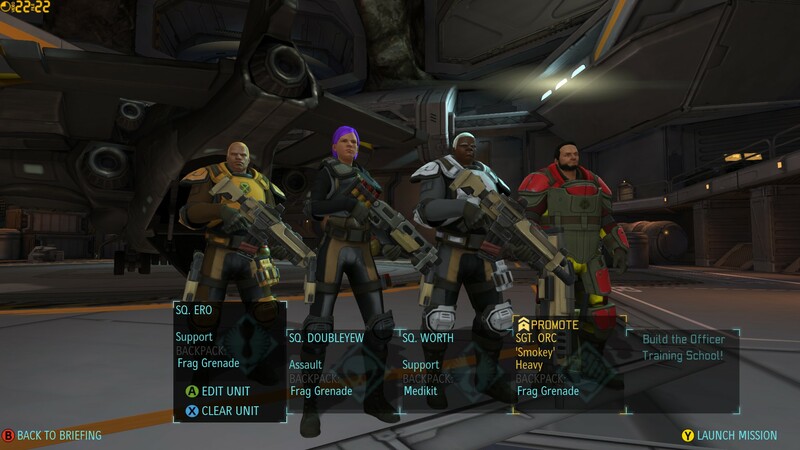 Five tense XCOM soldiers line up outside that last room. My point man breaches the door. One lousy alien is inside. 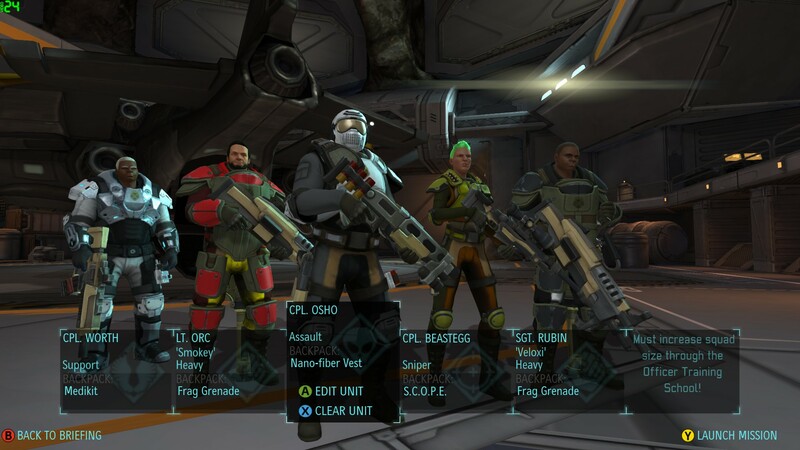 Five very cranky XCOM soldiers unload their weapons point-blank. As noted, Mexico is at panic level 5! If I don’t reduce it by the time the Council convenes at the end of the month, Mexico will bail. Panic is also dangerously high in two more countries (France and Argentina), and worrying in seven more (China, Japan, India, Egypt, South Africa, Canada, and the UK). Against this, I have one satellite (which will be my third total) in construction, and while the last mission gave me enough cash to build satellite #4 (or even #5, if I sell some loot and completely neglect better weapons/armour), it won’t be ready until early May. So far, I’ve won the battles. But I could still lose the war. 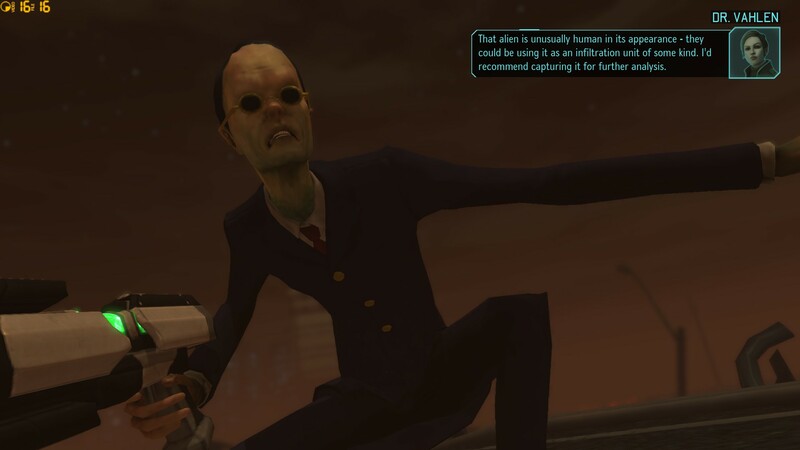 Coming this weekend: Part 3, in which XCOM faces its most terrifying foe yet. No KIA in this instalment (hurray! ).